Most of the Jio users get speed around 250-400KB/s, and only very few people are enjoying 5-50MB/s speed.If you are getting an average speed of 250KB/s, Don’t worry after implementing this trick your speed will be increased at least by 200%. As Jio is having a large number of subscriber base, it is not that easy for them to maintain same speed across the nation, there will be speed variation from place to place according to various Geo-Features. 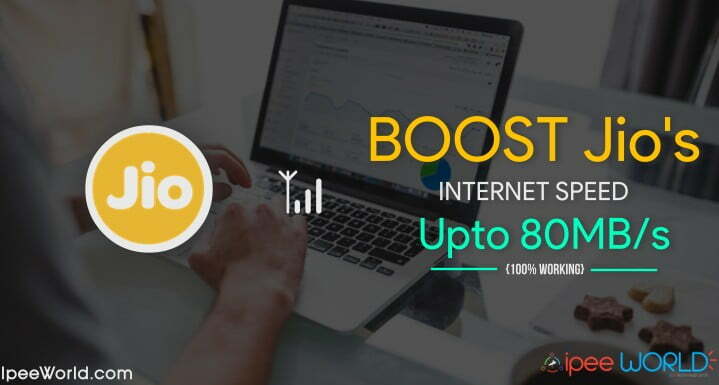 After implementing the trick mentioned below, Your Jio Internet speed will increase and you can download or stream Videos and other files in a Great Speed. Did I receive about 34+ Messages from my visitors, asking How To Increase Reliance Jio Speed? after getting this message over and over again I finally decided to write this Article that will help you to Increase your Jio Speed up to 80MB/s. If you are having a Jio Sim and wanted to use it on a 3G or 4G Dongle, then the read the guide to use Jio on Dongle. So without wasting any more time, let’s quickly jump into the tutorial and see how to increase Jio Speed. Below I’m sharing multiple methods, so, try each and every method and check which one gives you the high speed and better result. 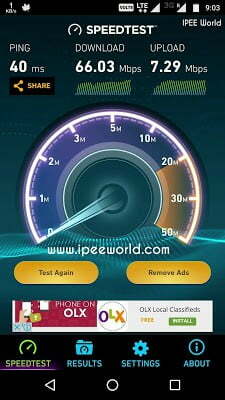 Below given is a screenshot, taken by me after conducting a Speed Test. Before applying the Trick I used to get up to 3MB/s and After implementing the Trick, Highest ever recorded speed in my location was about 65MB/s. Below given are some APN Settings that you can change to Increase Reliance Jio Internet Speed. Every Service Provider will have some APN Settings that enable its users to access the Internet. A misconfigured APN Settings can literally decrease your Internet Speed. So, it is recommended to change the APN Settings to the one given below (High-Speed APN Settings For Reliance Jio). It is no way harmful to your device, In case it drops your Speed, then you can easily restore the Defaults and get back into Old APN Settings. Go to Settings > More > Network > Access point Names and type the following settings there and save changes. Changing the LTE Band setting of your Device can also boost your Reliance Jio 4G Internet speed to a great extent. If your device is of MediaTek processor or Qualcomm chipset based, you can apply this trick and increase Jio speed. Download Shortcut Master Lite App from the Google Play Store. Open the Menu from the Dashboard. Click on Secret Code Explorer. From the codes appeared press 0(Zero). Select Band LTE from the service mode screen. Restart your Phone and see the magic. Download MTK Engineering Mode App from the Google Play Store. Open the App and Change the LTE Band Setting to 40 with 2300 MHz. Restart your Phone and see the changes. Now Open any Web Browser (UC Browser works fine) and try to download anything. 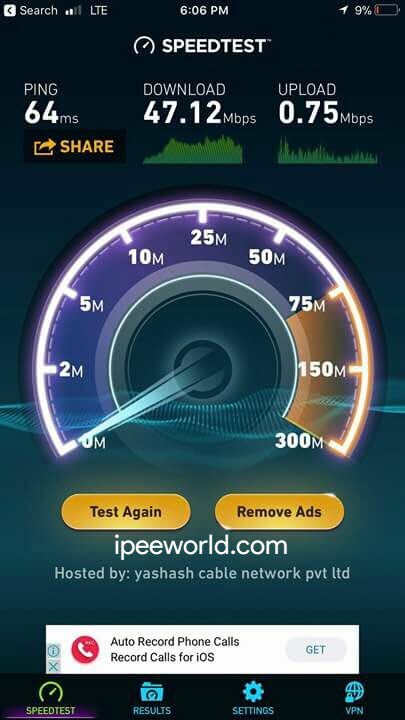 Firstly, Download Speed Meter Lite App from the Google Play Store. Connect your Mobile Network to “Band 40“(Very Important). Install the JioTV App from Play Store – Open “RIL AGM” Channel and Set Quality to High. Now keep checking the Speed of the Meter and Note it down. After applying this trick, it will give you High Speed while watching or Streaming Videos online through any App like JioTV, Hotstar, etc. Firstly, Download 3G/4G Speed Optimizer App in your Phone. Select Network speed mode and choose 12/28/7. Finally, click on the Apply Tweak button. You all know that by clearing Cache on our device, it can increase the performance of our Device. In the same way, it can also Increase the Internet Speed by removing unwanted cache and other files from our Device.Follow the instructions mentioned below to get a brief Idea about it. Click on Storage and USB. Press OK, that’s it, we have cleared unwanted cache from our device. You can also use third party Apps like Clean Master, etc to Clear Cache, This Apps work really well than Manual method. I would recommend you guys to use the app called Clean Master, which is a great App to remove Cache and Speed up any Android Device. Clean Master is having an Average user rating of around 4.7/5 by 40,622,210 Review and 500 Million+ Downloads on the Google Play Store alone. I also tried some of the trick mentioned in this article on my Brother’s iPhone and guess what, it worked fine. On my brother’s iPhone, I was getting a speed of about 45MB/s. So, Guys, these were some of the best working methods to Increase Reliance Jio Internet Speed at least by 200%. I have managed to share more than 5 different methods to increase jio speed. If you are one among Jio Users who get throttling Internet speed, then I suggest you try the Methods mentioned above and see the magic. I hope that above-mentioned tricks worked for you and increased your Jio Internet Speed. These are simple tricks that can be applied by any smartphone users, No technical skills required. Now do share this post on your favorite Social Media and let your friends know about this Hidden secret tips to Increase Reliance Jio 4G Internet Speed. Do Comment down Below if you face any problem and also be sure to share your Internet Speed down below in the comment section. And Again No Technical Skill Needed to Increase Jio 4G Speed. How do i bypass jio 1gb limit on my pc? Didn’t helped much for me, The MNC Trick doesnt work….I tried Band 40 no luck, Cant Find FDD LTE Mode in MTK Engineering app…..Any video demonstration? Thanks, it’s amazing. But not able to increase speed up to 60 Mbps. Ookla app shows only 5 Mbps. But using first APN method.